Ragnar Klavan scored in injury time to give Liverpool a dramatic Premier League victory over Burnley and extend their unbeaten run to 16 matches. The hosts looked to have earned a point when Johann Gudmundsson equalised with just three minutes of normal time remaining. But Klavan headed home from almost on the goalline as the Reds snatched all three points. Sadio Mane had given Liverpool the lead earlier in the second half with a superb shot from the edge of the area. 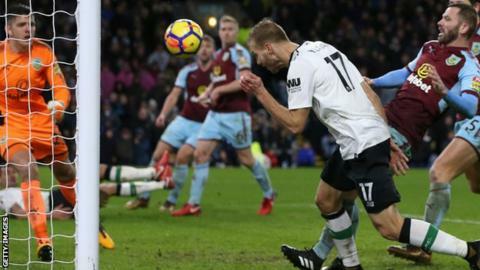 Burnley goalkeeper Nick Pope made several good saves to keep his side in the match, while opposite number Simon Mignolet denied Sam Vokes just before Gudmundsson's equaliser. Victory moved the fourth-placed Reds within a point of third-placed Chelsea on 44 points, while Burnley stay seventh. Liverpool have not lost in their past 13 Premier League matches, but the Clarets are on a run of five without a win. Klavan and defensive partner Dejan Lovren could find their places under threat following the arrival of Virgil van Dijk from Southampton for £75m. So their combination for Klavan's 94th-minute winner, with Lovren providing the assist with a flicked header, was timed to perfection. The duo were part of a Liverpool side showing seven changes from the one that started the 2-1 win over Leicester, with injuries keeping Mohamed Salah and Philippe Coutinho out for this match and - as Klopp revealed later - possibly for the FA Cup derby with Everton on Friday. The Reds were not quite as fluent as they have been at times in their unbeaten run, and it took a moment of class from Mane to break the deadlock, with a spin and shot on the turn - following a good cross from Trent Alexander-Arnold - giving Pope no chance. Adam Lallana impressed on his first start of the season following a thigh injury, producing an energetic performance before he was replaced just before the equaliser. Had Klavan not intervened, Gudmundsson's goal would have give Burnley a point that a tenacious performance would have merited. Sean Dyche's side have a reputation for doing well without the ball, and conceded just over 62% of possession to Liverpool before the interval. They had threatened on the break in the first half, and the momentum was with them by the time of the equaliser. Pope helped to keep them in touch with several important saves, including a one-handed effort to deny Alex Oxlade-Chamberlain at close range just before Gudmundsson struck. But a lapse in concentration allowed Liverpool in, and while talk of a top-four finish may have faded, Burnley's resilience could still see them push for a place in the Europa League. Burnley manager Sean Dyche: "We grew into the game, the second half was an even affair. "On and off the pitch we have moved forward in a calendar year. We are becoming assured of ourselves in this division. "We are playing a more mixed game now. Last year we got it forward more often but we are calmer now. We are resolute defensively, we have added to what we had. The quality has risen. "To be on 34 points and be unfortunate to not have 35 shows what a season we have had." Liverpool manager Jurgen Klopp: "A fantastic finish to the game. This is one of the toughest places to play all season. Liverpool have now gone 16 games unbeaten in all competitions (W11 D5), their longest run under Jurgen Klopp. This is also Klopp's longest run of matches without a defeat in the Premier League (13 games). Burnley have conceded more goals in their past two Premier League games at Turf Moor (five) than they did in in their first nine of the season (three). The Clarets have not won any of their past five league games (D3 L2); they last went longer without a victory in the top-flight in April last season (seven games). Gudmundsson has been directly involved in six Premier League goals this season, at least two more than any other player for Burnley. Mane has had a hand in five goals in his past four Premier League games away from Anfield (two goals, three assists), as many as his previous 15 combined. Klavan scored his first Premier League goal for Liverpool in his 34th appearance in the competition; it was the first goal by an Estonian in Premier League history. Following Klavan's goal, players of 97 different nationalities have now scored a Premier League goal (excluding own goals). Burnley face Man City in the FA Cup on Saturday at 15:00 GMT, and are back in Premier League action on 13 January, when they travel to Crystal Palace at 15:00. Liverpool host Everton in a Merseyside derby in the FA Cup on Friday at 19:55. Their next league outing is at home to Manchester City on Sunday, 14 January at 16:00. Match ends, Burnley 1, Liverpool 2. Second Half ends, Burnley 1, Liverpool 2. Substitution, Liverpool. Joel Matip replaces Alex Oxlade-Chamberlain. Goal! Burnley 1, Liverpool 2. Ragnar Klavan (Liverpool) header from very close range to the bottom left corner. Assisted by Dejan Lovren with a headed pass following a set piece situation. Goal! Burnley 1, Liverpool 1. Johann Berg Gudmundsson (Burnley) header from the right side of the six yard box to the bottom right corner. Assisted by Sam Vokes. Attempt missed. Sam Vokes (Burnley) header from the centre of the box is close, but misses to the right. Assisted by Charlie Taylor with a cross. Substitution, Burnley. Nahki Wells replaces Scott Arfield. Hand ball by Steven Defour (Burnley). Attempt saved. Sam Vokes (Burnley) header from the centre of the box is saved in the bottom left corner. Assisted by Johann Berg Gudmundsson. Attempt saved. Alex Oxlade-Chamberlain (Liverpool) right footed shot from a difficult angle on the right is saved in the bottom right corner. Assisted by Dominic Solanke. Attempt missed. Ashley Barnes (Burnley) header from the centre of the box misses to the right. Assisted by Johann Berg Gudmundsson with a cross following a corner. Corner, Burnley. Conceded by Dejan Lovren. Attempt missed. Ashley Barnes (Burnley) left footed shot from the centre of the box is close, but misses to the left. Assisted by Scott Arfield following a set piece situation. Attempt missed. Ben Mee (Burnley) header from the centre of the box is high and wide to the left. Assisted by Phil Bardsley with a cross following a corner. Corner, Burnley. Conceded by Joseph Gomez. Attempt missed. Dejan Lovren (Liverpool) header from the centre of the box is close, but misses to the right. Assisted by Adam Lallana with a cross following a corner. Corner, Liverpool. Conceded by Ben Mee. Corner, Liverpool. Conceded by Nick Pope. Attempt saved. Trent Alexander-Arnold (Liverpool) right footed shot from outside the box is saved in the top right corner. Assisted by Adam Lallana. Corner, Liverpool. Conceded by Scott Arfield. Attempt blocked. Adam Lallana (Liverpool) right footed shot from outside the box is blocked. Assisted by Emre Can. Substitution, Liverpool. Roberto Firmino replaces Sadio Mané. Attempt missed. Georginio Wijnaldum (Liverpool) right footed shot from the right side of the six yard box is too high. Assisted by Alex Oxlade-Chamberlain with a cross following a corner. Attempt saved. Steven Defour (Burnley) right footed shot from outside the box is saved in the bottom left corner. Assisted by Scott Arfield. Goal! Burnley 0, Liverpool 1. Sadio Mané (Liverpool) left footed shot from the centre of the box to the top left corner. Offside, Burnley. Phil Bardsley tries a through ball, but Jeff Hendrick is caught offside.